I'm a little surprised at Cartoon Brew's insistence than Avatar be considered an animated film. I don't know if the reason is because it is the highest grossing film in history and they want animation to have some of the glory or if it's because James Cameron is so insistent that Avatar should not be tainted with the 'A' word. In any case, there are reasons (beyond whatever anyone thinks of Avatar) why I don't think considering it an animated film is a good thing. Those outside the film business may not be aware of the distinction between production and post-production. In a live action film - one with no animation or special effects - production is the shooting of the film. Post-production is what happens after the film is shot. Those things typically include editing, music, sound effects, dialogue looping, the sound mix and titling. When a film does include special effects, unless they are done in camera during the regular shoot, they are considered post-production. In the past, certain effects like in-camera matting, hanging miniatures and glass shots were done during production, but most effects were done during post. In what we would all acknowledge as typical animated films (Snow White, Toy Story), animation is production, not post-production. In films that have animated elements added (Jurassic Park), animation is done in post-production. This may seem like an esoteric distinction, but it's the difference between what is central to a production and what sweetens a production. I am not in any way dismissing the importance of post-production. A film's music score has a huge impact on how the film affects audiences and certainly Jurassic Park's impact depended tremendously on the quality of the dinosaur animation, but in each case, the post-production elements are driven by what has already been shot. Animators may have worked over Avatar's motion capture and added creatures, but their work was driven by what had been shot (or in this case, recorded). To pretend otherwise is disingenuous. There is no question that Jack Pierce's Frankenstein make-up added to the audience's perception of Boris Karloff as the monster. However, many actors at Universal played the monster (Bela Lugosi, Glen Strange), yet Karloff is generally considered the definitive performance. While Avatar's animators supplied more than digital make-up, it's still the underlying motion captured performance that counts. I've written extensively on how fragmented the process of making an animated film is and how so many of the acting decisions are made before the animator starts work. The character designs, the storyboard and the voice performance all make acting decisions that constrain the animator's interpretation. There is no question that motion capture is yet another constraint, probably larger than all the others. To insist that Avatar is an animated film is to marginalize animators even more than they are in what are generally considered animated films. Is this the direction we want things to go? Better to agree with James Cameron and focus our attention on films where animators create, not enhance, performances. Robert Iger's free-spending ways have caught up to him. Having purchased Pixar and Marvel for a combined total of $10 billion, the studio has to start making some serious coin in order to pay off the purchases. The strategy is to focus on $150 million films that can be heavily merchandised or films that cost less than $30 million. Anything that falls in the middle of those two budget neighborhoods is out, even if it's a proven money maker. The Proposal, a Sandra Bullock film that cost $40 million and that grossed $315 million worldwide won't have a sequel as a result of this policy. The franchise-intensive mantra came after Disney CEO Robert Iger admitted publicly and unflinchingly that 2009 had been "awful": Having started the year with Confessions of a Shopaholic (domestic gross: $44 million) in the worse recession of all time, it then summered with the costly $150 million rodent flop G-Force (domestic gross: $119 million), and spent the end of the year eating turkey upon turkey: The Bruce Willis action flick Surrogates (domestic gross: $38 million) was laughable; the comedy Old Dogs (domestic gross: $48 million) was not. To help pay for the whopping $10 billion Disney spent acquiring Pixar and Marvel in recent years, Iger decreed that s the world's largest licensor of consumer products, Disney needs its film not to merely succeed in theaters, but to sell gobs of spinoff merch, as well: In 2008, the company sold some $30 billion worth of licensed consumer products, and suffice it to say, exactly none of that came from Sandra Bullock hand towels. The problem, as I see it, is that this is a high risk strategy. G-Force proves that. It's at exactly the budget that Iger thinks is going to save the company. Flops at that budget level will hurt badly. If Eisner's tenure was defined (at least initially) by how successfully he capitalized on Disney's brand, Iger's tenure is going to be defined by how his purchases affect the bottom line. He's dug himself a $10 billion hole and now he has to climb out of it. Often, a first isn't really the first. It's simply the first that people remember. Steamboat Willie isn't the first sound cartoon, but it's the one that made a difference, so it's the one that enters the history books. If a first isn't very good, it tends to be forgotten. 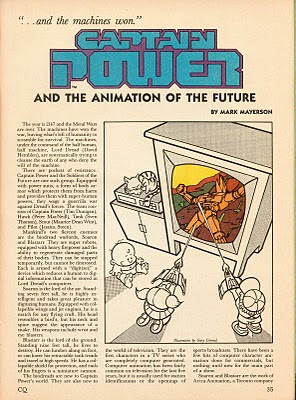 That's the case with Captain Power and the Soldiers of the Future, the first TV series to include computer animated characters. It ran only 22 episodes in syndication in 1987-88. I wrote the article below as production on the series was ending. It's ironically fitting that the article appeared in the first and only issue of Cartoon Quarterly, edited by John Cawley and Jim Korkis and published by Gladstone in the fall of 1988. The magazine had a fannish slant, but the roster of writers is one that readers of the blogosphere will recognize. Besides Cawley, Korkis and myself, the authors included Leonard Maltin, Jerry Beck, Floyd Norman, Will Finn, Scott Shaw! and Mark Kausler. 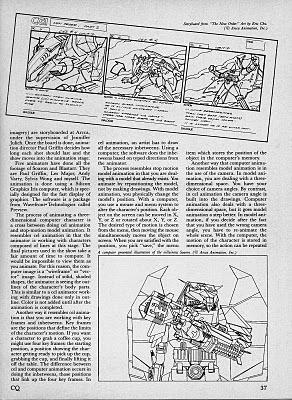 The magazine showed a lot of promise and this 22 year old issue is far more interesting than any recent issue of Animation Magazine. Unfortunately, the magazine is as forgotten as Captain Power. Ed Hooks is the author of Acting for Animators. While his own background is not in animation, he's identified many things that animators need to be thinking about while doing their work. One point that he's made is that the quality of a performance is based on the script supplying the necessary foundation for building a character. 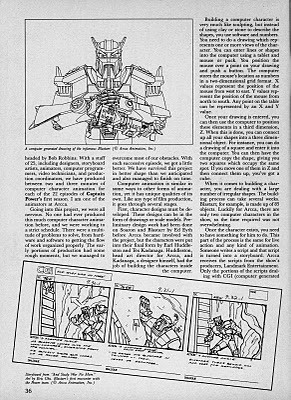 In his February 2010 newsletter (scroll down for the relevant material), he talks about the shortcomings of Avatar's script from an acting standpoint. Zoe Saldana is Neytiri, the Na’vi female lead. She has been raised in a kind of New Age Garden of Eden. The Na’vi spend a lot of time tuning into trees, plants and their spiritual vibes. But what are Neytiri's personal values? The script really doesn’t say. In her first scenes, she's helping chase off those pesky humans. But then, in the second act of the script, she befriends the fake Jake avatar and gets romantic. And, at the very end of the story, she slays the dragon, Col Quaritch. You look through the script again and again, searching for clues about Neytiri's values, childhood, former love life…anything at all that might help. Not much there. She’s a Na’vi princess, that’s all, and she does what Na’vi princesses do. She is reactive to the events that happen to her. It is difficult to find her objectives. The transitions in her character don’t really work. I found this essay particularly interesting in light of James Cameron's complaints that the actors in Avatar were passed over for Oscar nominations. Cameron specifically mentioned Zoe Saldana as being ignored. Cameron's view was that the technology involved was somehow seen as cheating, but as Hooks points out, the problem was not the technology, it was the script. Hooks criteria could, and should, be applied to recent animated features, many of which suffer from the same shortcomings. While animation artists are constantly asserting "story, story, story!" the truth is that their understanding of story is lacking. Too many animated films have a disconnect between personality and plot, where characters do things based on the needs of the plot rather than the needs of the character. 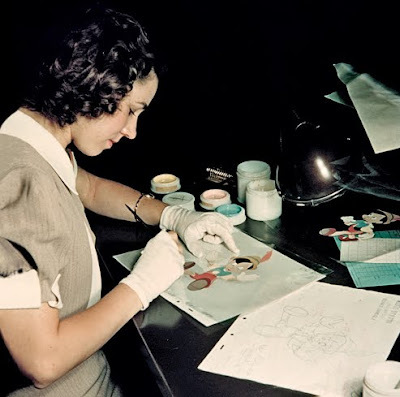 Patricia Zohn writes about the women of ink and paint during Disney's golden age over at Vanity Fair. 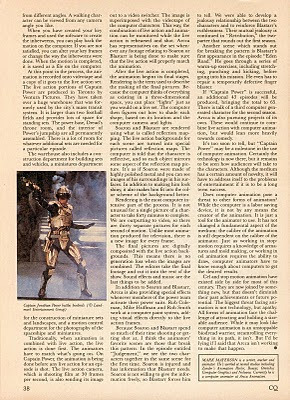 The article includes original interview material with some of the women, one of whom was Zohn's aunt. 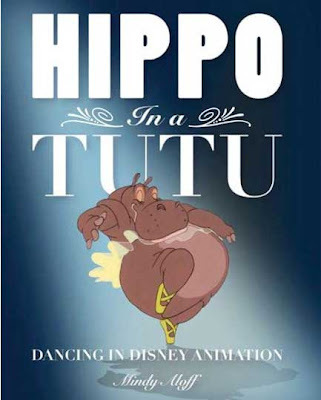 Mindy Aloff, author of Hippo in a Tutu, is interviewed by Kent Worcester of The Comics Journal. "Both animation and theatrical dancing are labor-intensive activities that benefit from a benevolent visionary at the helm. Animation today could learn much from what Walt Disney arranged for his staff to do: to visit the ballet and sketch the dancers. And dancing could benefit from Disney’s appreciation of melodic, song-based music with a clear pulse as a floor for dancing. Unfortunately, the simple pleasures of dancing that asks the performer to use a comprehensible vocabulary of steps and expressive gestures, which relate moment by moment to music, are exactly what most students of both animation and choreography want to evade now. Balanchine, in fact, once wrote about how dancing could learn about the elaboration of fantasy from cartoons. Artists globally, though, don’t want what these historical animated films are equipped to teach – joy as the text and complication as the subtext; instead, they want complication, edge, as the text and more complication as the subtext. I think the culture is going to have to change for either group to learn from one another, and I just don’t see that happening in my lifetime. Perhaps a few individuals will take this as a challenge and prove me wrong. I certainly hope so."